We tested eight immersion blenders to find the ones that are champs at puréeing, blending, and crushing, yet still easy to use. Editor's Note: This review has been updated with notes on the non-winning models tested, in the section titled "The Competition." A good immersion blender—also known as a hand blender or stick blender—can complement a well-equipped kitchen, offering a convenient alternative to dragging out a big, lumbering stand mixer just to whip a little cream for a slice of pie, or to make a one-egg batch of mayonnaise for a sandwich. A great immersion blender can replace expensive and bulky kitchen tools, giving you similar performance at a fraction of the footprint. Although I don't want to live without a jar blender or stand mixer if I can help it, it's nice not to have to break those things out all the time. All hand blenders can perform the basic tasks of whipping, blending, and emulsifying reasonably well, but we wanted to find out which one truly deserves that coveted spot in your kitchen. We tested eight immersion blenders and found a winner capable of creating silky-smooth soups and thick smoothies, along the lines of some of the best countertop blenders out there, while being small enough to fit in a drawer. Through round after round of rigorous testing, the All-Clad easily knocked out the competition. This heavyweight was the fastest and most efficient at burrowing through burly ice cubes, transforming stubborn celery fibers into a luxurious purée, and emulsifying mayo in a blink. The sleek design tapers near the top, making it easy to grip and maneuver, although it was the weightiest model we tested. With easy-to-read arrows illustrating which direction to turn in to twist off the blending shaft, it's a cinch to clean and store. This unassuming model ended up being a sleeper hit, consistently doing in much pricier units and comfortably keeping up with our champ throughout rounds of testing. The Hamilton Beach's wide blade guard, with its large vents, creates a perfect vortex when blending. Despite being the smallest and lightest of the contenders, it easily whipped cream, made perfect mayonnaise, and aced crushing ice. It also comes equipped with a mini chopper and whisk for anyone who loves a little extra swag. The most important quality of an immersion blender is its ability to blend things. In a perfect world, the ideal immersion blender would be able to execute the same tasks as a full-sized blender, from silky cauliflower purée to smooth nut butters. Unfortunately, there are inherent limits to what an immersion blender can do. The manufacturers of every model we tested warned that the units should be in continuous use for only a minute at a time, to avoid overheating the motor. This automatically rules out some full-sized-blender tasks, such as cooking soup in a blender from start to finish. But for any under-a-minute tasks, we wanted a hand blender that could hold its own. We also looked for immersion blenders that were comfortable to hold and operate. Since an immersion blender is not stabilized, like similar blending and puréeing tools, it needs to be easy to grip and operate with one hand. We took note of the design of the trigger, as well as the circumference of the shaft: Models with wider shafts were unwieldy, while those with tapered grip designs were easier to hold for testers of all hand sizes. Given that it's a tool you'll reach for again and again, an immersion blender needs to be easy to clean. All but one of the models we tested had a detachable blending wand, making them easy to wash without fear of getting water in the motor housing; several of the blending wands were also dishwasher-safe. Variations in blade design made some models simpler to clean than others. The best required little more than a quick rinse to remove thick purées from the underside of the blade, while the worst left behind a dangerous tangle of vegetable fibers and sharp metal. Lightweight and slim, immersion blenders can appear to have all the grit of a Bichon Frise, but the reality is that they're no less than the business end of a blender, minus nearly all of the protection. If mishandled, they can be one of the most dangerous cooking tools. We know more people who have gone to the ER for an immersion blender injury than just about any other...and we've seen almost every kitchen mishap imaginable. It's easy, in a moment of absentmindedness, to leave the unit plugged in while trying to pry free a chunk of food from the blade. With just a gentle tap of the power trigger at this critical moment, the blade will spin dozens of times before you've even realized what's happened. Your innocent morning smoothie routine will have suddenly become a grisly dash to the hospital. If that weren't scary enough, our tests revealed that the most effective immersion blenders are also the ones with less protective covering over the blade. Narrower, cupped blade-guard designs that fully shielded the blade performed poorly in the tests. Models with wider, shallower blade guards did significantly better, quickly drawing ingredients into a powerful vortex. The downside of such an effective design is a readily exposed blade—I even cut myself while removing one of these blenders from the packaging. Three of the units we tested came with a safety locking mechanism, intended to minimize risk of accidental activation. We love this idea in theory—anything that makes a hand blender safer is a welcome addition—but in all cases, the feature was so awkward and unwieldy that we gave up on it in frustration. On two of the models, for instance, the unlock button had to be held down while we simultaneously pressed the "on" button. But the buttons had been positioned so that pressing both with a single hand was impossible. As we were forced to use both hands just to turn the blender on, the container below was left unsecured, free to fly all over the place. Safer fingers are great, but not if you end up with mayonnaise ingredients splattered across the countertop. We hope that, eventually, a brand will design a good immersion blender with safety features that don't handicap function. We don't believe there is one out there right now. Because most immersion blender injuries occur during cleaning, we recommend having a crock of hot water at your side to quickly dip into, so you can blitz away any stubborn bits before unplugging the machine for a good scrub. One of the most practical uses of a hand blender is blending soups until they're silky-smooth, right in the cooking pot. It lets you avoid the fuss of transferring a piping-hot liquid into a standing blender, and minimizes the chance of ending up with soup on your ceiling (the steam generated by a lidded blender's vortex can be very, very powerful). We chose to blend celery soup for our testing, and we intentionally left the fibrous celery unpeeled and in large chunks to really push these stick blenders to their limit. This proved to be a difficult challenge for all the models. We had each one blend 300 grams of soup, with equivalent proportions of liquid to solid, for two minutes total (with one minute of rest in between, to respect the manufacturers' one-minute-max run-time rule). After blending, we passed the soup through a fine-mesh strainer, while pressing on the solids to extract as much liquid as we could. We then weighed how much pulp was left behind. The results of the test were split. Four of the units performed well, leaving only 38 to 68 grams of pulp behind; three struggled, leaving over 100 grams of vegetable matter in the strainer; and one model completely failed, leaving more than 200 grams of pulp for the compost pile (and some extremely watery soup to eat). To our surprise, the immersion blender that performed the worst was the most expensive model of the bunch. Only the All-Clad yielded a final soup that was fit to serve, creamy and rich, all in well under the two-minute blend time. The remaining contenders' soups were noticeably grainy and had to be re-blended in a Vitamix before becoming completely smooth. For our second purée test, we used each immersion blender to blitz one can of drained chickpeas with one-third of a cup of water, along with five drops of blue food coloring. We timed each one to test how long it took for the blue dye to become evenly distributed throughout the purée. The dye also helped us judge the texture of each purée. Our winning immersion blender came out on top again, creating an almost perfectly silky-smooth purée, with uniformly distributed dye, in an instant. Our winning budget pick took 20 seconds to distribute the dye and resulted in a less-than-perfect purée, but it still outperformed blenders over four times the price. The models with blade guards of smaller diameters struggled to blend all the beans, leaving whole chickpeas behind even after a full minute of blending. When we finally gave up, they still had whole beans trapped under the blades. We tested how each immersion blender performed at crushing one pint of ice with one cup of water. If your morning routine is anything like mine, it probably involves dragging a blender out of the cupboard to load up with frozen bananas and yogurt. If that habit could be simplified through the use of a compact immersion blender, that alone would make it a useful investment. The ice-crushing test we set up took the smoothie task into overdrive, demanding that the machines work their way through a packed container of dense ice cubes, with just enough water to get things moving. We tested not only how quickly each blender chewed its way through the glaciers, but also the consistency of the final slush. Some models struggled with consistency more than others, leaving some big chunks behind. The All-Clad, along with one other model, blended the ice to the finest and most uniform consistency in about 15 seconds. Two models left unblended ice cubes behind, even after 45 seconds. We were surprised to see that our budget pick outperformed many of the more expensive models, though it did begin to feel very warm after just one round. To evaluate its durability, we put the Hamilton Beach through a stress test, blending round after round of ice—not something we'd ever recommend doing in real life. Aside from a faint electrical smell coming from the motor, this lightweight held its own, so we feel confident it can handle your next frozen daiquiri without breaking a sweat. The biggest variation from one model to the next was an issue we hadn't thought about—mess. Once again, we noticed that the units that had wider blade guards, with larger vents on the side, performed the best. Those models easily pulled the ice and water into a vortex, cleanly moving up and down in the containers as they churned. The models with narrower blade guards had difficulty drawing water and ice to the blade. They required more up-and-down movement in the cups, resulting in excessive spilling and splatter. To test each model's emulsification skills, we made a batch of mayonnaise with each, using one egg and one cup of oil, plus mustard and lemon. Not surprisingly, all the models were able to make superior mayonnaise. While some were faster than others at the task, every one eventually got there in less than 30 seconds, all with equal consistency. The fastest model, the All-Clad, emulsified the egg and oil in just eight seconds, and the slowest took 24—but if 16 seconds is a deal-breaker, you're probably more of a Duke's kind of person anyway. Our most expensive unit, which failed horribly at every other task, could at least still make mayonnaise. If you need whipped cream to top a sundae or finish a dessert, an immersion blender is the perfect tool to make a thick and rich topping. It's faster than whipping by hand, which can often lead to spatters on your counters and yourself, and easier than setting up a stand mixer or handheld electric mixer. We wanted to test each immersion blender's competence at whipping one and a half cups of cream, timing how long each model took to do it and judging the final consistency of the product. All the blenders were able to fully whip the cream in well under a minute. Our winning All-Clad was once again the fastest, yielding an evenly whipped texture after only 20 seconds, with the budget Hamilton Beach not far behind at 32 seconds. The slowest models took nearly a full minute, once again following the trend we'd noticed—head shape matters above all else in immersion blender performance. The immersion blenders with narrower blade guards began struggling with the task as soon as the cream had just begun to thicken. This led to an overall slower whipping time, along with spatters and unevenly whipped cream. The whipped cream from these lesser models had a layer of un-whipped cream floating right on top, and any attempt at incorporating it with the immersion blender risked over-whipping the rest. The models with wider head shapes and larger vents spun the cream within the container more evenly, resulting in better consistency in the final product. Most of the blenders could perform lightweight tasks, such as making mayonnaise or whipping cream, at least decently. The tests that really set them apart were those that required more intense blending. All told, the All-Clad was far superior to the rest. Our top pick produced perfectly smooth puréed soup and finely crushed ice with ease. If you plan to make only mayo and whipped cream, the budget Hamilton Beach performed as well as, and sometimes better than, many higher-priced models. In fact, the most expensive unit repeatedly placed last, in test after test. In the end, we believe that when shopping for an immersion blender, you should either go high or go low. If you don't mind the splurge and want an immersion blender that can do it all, spring for the All-Clad. If you need the occasional supplement to your more powerful countertop blender, one that's quick and easy to use, then grab our budget pick. It can hang with the best of the rest. What we liked: This wasn't even a close race. The All-Clad immersion blender outperformed all other models time and again, with results comparable to those of a full-sized blender. It easily demolished tough celery for soup, leaving little pulp behind. It accomplished lightweight tasks, like whipping cream and making mayonnaise, almost instantly, while difficult jobs, like ice-crushing and puréeing beans, were done nearly as fast. This model has the widest blade guard, with a diameter of three inches, resulting in a readily exposed blade that's capable of easily chopping and blending thick or tough items. It also has large vents, which produced a vortex while blending liquids, for better distribution and a more even and consistent final product. It comes equipped with an extra-long, five-foot power cord, giving you room to maneuver in your kitchen. There's an easy-to-use dial at the top for adjusting the speed, and even a turbo button if you need to kick into high gear. And, while this was the heaviest of the immersion blenders we tested, at two and a half pounds, we mostly appreciated its form: The tapered grip was easy to hold, and the nine-inch blending wand meant you could reach deep into a large pot without much trouble. What we didn't like: Although the twist-off blending-wand design on the All-Clad has arrows to illustrate which direction to turn, we much preferred the release button some other units had for quick removal. Once removed, the blender wand is not dishwasher-safe, and is, in fact, hollow. The manufacturer warns against water entering the wand, so extra-careful washing is necessary. This model does not come with any attachments, but a whisk attachment is available for purchase separately. What we liked: At just over one and a half pounds, the lightweight Hamilton Beach held its own next to much more expensive models in multiple rounds of testing. The two-and-a-half-inch-wide blade guard, coupled with large vents, created a considerable vortex, making quick work of purées, whipped cream, and even ice. It blended soup as well as some other serious contenders, but at a fraction of the cost. Its petite design and nonslip grip make it comfortable to hold—it's a tool you'll reach for without a second thought. The Hamilton Beach also comes equipped with a whisk attachment for batters and egg whites, and a three-cup chopper attachment perfect for nuts and garlic. 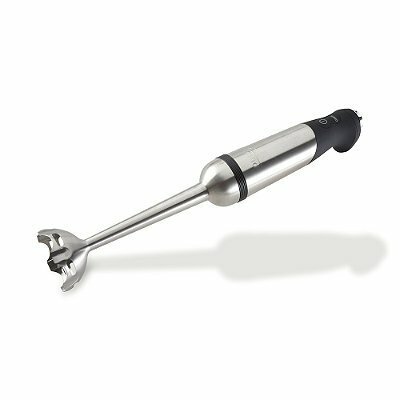 The attachments and the blending wand are top-shelf dishwasher-safe. The blending wand is eight inches long, allowing you to reach deep into various containers. What we didn't like: We're unsure of its longevity against tough tasks, such as making smoothies or blending ice. The twist-off blending wand never felt particularly secure, and it doesn't click into place or provide any other indication that it's been securely attached. 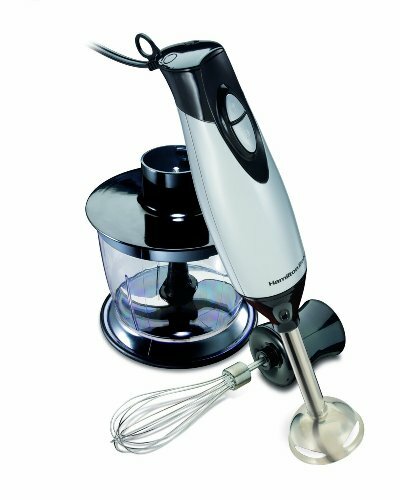 The KitchenAid 5-Speed Hand Blender was nearly the same price as the All-Clad, but it trailed in testing, with results similar to the much less expensive Hamilton Beach 2-Speed. The Breville Control Grip Immersion Blender had the slowest blend times in our testing, which we attribute to its narrow blade guard and deep-set blade. It struggled to pull in soup and cream to purée and whip, and its tight shape was also one of the most difficult to clean. If the long blend times don't turn you off, this is a good choice for anyone interested in a coated blade guard that won't scratch a Teflon pan. The Cuisinart Smart Stick 2-Speed Hand Blender and the Cuisinart Smart Stick Variable-Speed Hand Blender were comparable to our budget pick, the Hamilton Beach 2-Speed Blender, and the winning All-Clad, respectively. They were neck-and-neck with the winners in every test, but we found the safety feature—a theoretically great idea—to be too cumbersome for use: You have to press and hold down an unlock button while pressing the power button, but the placement of those buttons made it an awkward two-handed operation for just about everyone who tried it. We were very eager to test the Bamix 2-Speed 3-Blade Hand Blender, which is prevalent in many commercial kitchens (it's the original immersion blender). To our surprise, this model was the most expensive, yet repeatedly scored at the bottom of all of our tests. It struggled to purée soup and beans, crush ice, and even whip cream. The Braun Multiquick Hand Blender has a well-designed safety feature, along with several useful attachments. However, the narrow head shape and small vents meant it required long blend times to complete our tests.